Address: Khasra No.53, Near Vidhyashram International School, Village Uchiyarda, Jodhpur, Rajasthan 342027 India. A Marvel nestled in the Blue City on the fringes of Thar Desert; WelcomHotel Jodhpur is a royal odyssey to bygone era of the Marwar. 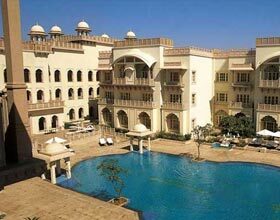 Located centrally, just minutes away from the Jodhpur airport and city railway station, this luxury hotel in Jodhpur is an epitome of royal living of the gallant Rajput yore. Infusing the elements of enriched folk culture, historically rich past and splendid architectural specimens, WelcomHotel Jodhpur is an ideal choice for tourists in the heritage Blue City. Pamper yourself like a king or a queen of a princely state at ITC Hotel"s signature Kaya kalp Spa, offering rejuvenating treatments. 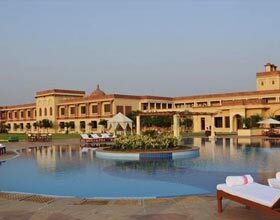 Also avail the services of exclusive world class gymnasium or reviving yoga sessions, along with onsite salon. 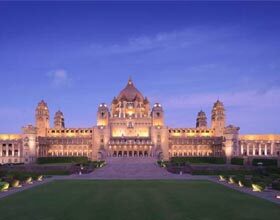 The sumptuous well appointed banquet and the alfresco venue exalts the glory of this splendid ITC hotel in Jodhpur. Intricate inlay work and flooring work are relished by the guests during their stay. WelcomHotel, Jodhpur - enclave warm amiable hospitality and impeccable services, the vibrant guestrooms are categorized into Deluxe Rooms, Jodhpur Chambers and Vilas. The sparkling colors portrayed in the rich upholstery, wall panels and wall ornate add charm and liveliness to the accommodations. Awe-inspiring wall décor and exquisite sit-outs with scenic landscapes from large bay windows of these modishly equipped rooms are adored by guests. A tempting feast with chef's finesse in blending the contemporary culinary with conventional savory spices, WelcomHotel Jodhpur is a delight for foodies. WelcomCafe Chinkara is a multi-cuisine restaurant serving lavish spreads during 3 meals of the day. An indulgence for the guests is an all day café Bistro Desert Rose offering array of beverages and canapés to nibble on.